The past weekend I attended Engelska Herr’s Leather Trunk Show guested by Frank Clegg Leatherworks, Heschung Shoes and Hestra Gloves. Lots of people were there during the day and I know that lots of shoes, gloves and bags were purchased. Unfortunately I arrived a bit later than planned but there was still a lot of action in the store around closing time. 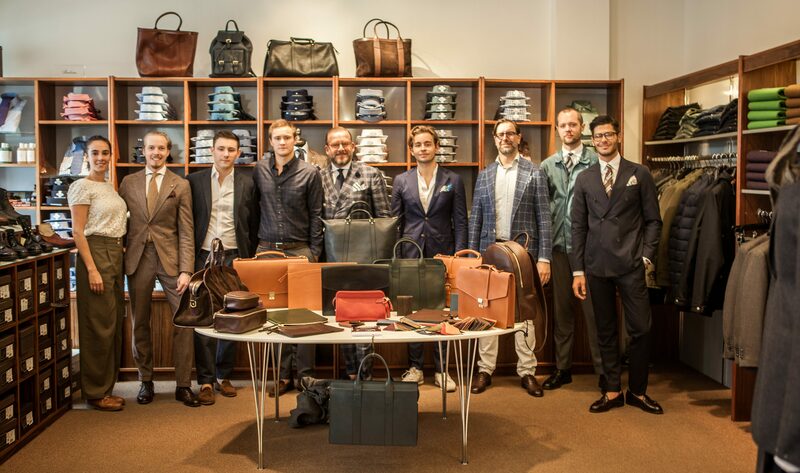 During the Trunk Show customers had exclusive access to order MTM, MTO and Bespoke collections from all three companies. Frank Clegg that I met just last week in Stockholm had a wide range of bags and accessories to show. The brothers Andrew and Ian where their once again, and from what I can tell, they enjoyed Malmö much more than STockholm =). Their Tall Tote Bag in Cognac really caught my attention this time and can easily be my next commission. Heschung also had a wide range of shoes both for men and women. Sarah, their Nordic sales representative was there with here charming French accent and with a smile on her face the whole day. If you’re interested in Heschung, you can read more in my previous post “Heschung, the shoes à la française, now in Scandinavia”. I will be reviewing a pair of their signature model “Ginkgo” later this autumn. Very interesting as also meeting Niklas, bespoke glove maker from the family owned company Hestra. He had brought a wide range of different leathers and lining and was taking orders for MTO and bespoke gloves the whole day. I took the opportunity to take my measurements and hopefully I will place and order very soon. I’ve never tried bespoke gloves before, and I think it could be time. Finding good fitting RTW gloves is as hard as finding a RTW suit nowadays. And as always, very nice to meet good friends at Engelska Herr. Store owners Axel and Wilhelm where having a good time (I tried taking a picture together with Wilhelm but he managed to close his eyes on all 10 pictures) and also Max, Gabriel and Martin where there giving the customers good service and valued advice. Extra service from Max as always, helping out as my personal nanny =) thanks Max!! Mr Paparazzi himself Pontus was of course there working the camera all day. Many of the pictures you see in this post were taken by Pontus. Looking forward to the next trunk show at Engelska Herr. Well executed gentlemen.